Home Unlabelled Deaths in Myanmar tourist plane crash. Deaths in Myanmar tourist plane crash. At least two people killed when flight carrying 51 foreigners crashes while attempting to land in heavy fog. 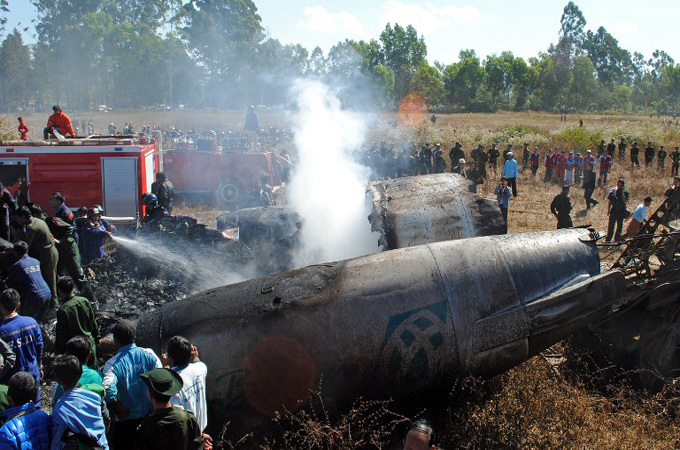 A Myanmar passenger jet packed with foreign tourists crash-landed and burst into flames in a field in eastern Shan state, killing at least two people and injuring 11 others, officials have said. Air Bagan said a Burmese tour guide on the plane was killed and a motorcyclist on the ground also perished. Two pilots were among those taken to hospital, according to Air Bagan spokesman Ye Min Oo. Fifty-one foreigners were among the 63 passengers, according to the information ministry. Two Americans, two Britons and one Korean man were among those taken to the hospital in nearby Taunggyi, according to Air Bagan, which described the incident as an "emergency landing". Two French nationals were also slightly injured, according to a French embassy official in Yangon. Black smoke was seen billowing from the charred wreckage of the Air Bagan aircraft, which came down near Heho airport, the gateway to the popular tourist destination of Inle Lake. The ageing Fokker-100 jet crashed while attempting to land in heavy fog, breaking its tail and catching fire, according to the ministry. "Because of the emergency landing near the airport, the plane broke up in the middle," a government official said, adding that passengers were evacuated. Yangon International Airport, the country's main terminal, is set to exceed its limit of 2.7 million passengers this year and the Department of Civil Aviation warned in July it needed urgent upgrading.